"When I got close to Baghdad, news reached me of the trial that had befallen Ahmad ibn Hanbal, and that it was forbidden to meet him and listen to him. I felt very sad because of this, so I went to an inn and did not go anywhere after my luggage had been taken to the room I had rented. Then I went to the great Jami' masjid, wanting to sit in the study circles and listen to what they were saying. So, I joined a circle, and saw a man speaking about the narrators of hadith, saying which were da'eef and which were qawiy. I asked someone who was near me, "Who is this?" He said, "This is Yaha ibn Ma'een.'" At this point Baqiy ibn Makhlad asked Yahya Ibn Ma'een a number of questions, then asked him about Ahmad Ibn Hanbal. Yahya Ibn Ma'een looked at him in surprise and said, "Who are we to talk about Ahmad ibn Hanbal?" He is the Imam of the Muslims and the best of them"
Baqiy ibn Makhlad concluded his story by saying, "Then I went out, asking about the house of Ahmad ibn Hanbal, and I was shown where it was. I knocked at the door and he came out to me and opened the door, and saw a man whom he did not know. 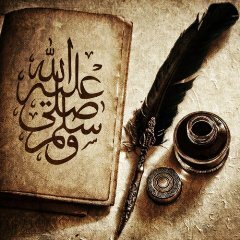 I said, O; Abu 'Abdullah, I am a seeker of hadith who is collecting the Sunnah, and I have only to come to see you.' He said to me, "Enter the corridor - I.e. that led to the interior of the house - so that no will see you. Where are you from?" I said, "Farther than that. I have to cross the sea in order to reach Ifreeqiyah. (I am from) Andalusia." He said to me, "Your land is indeed far away, and there is nothing dearer to me than helping one like you in his quest. But at the moment there is a problem of which you must have heard." I said to him, "Indeed, I heard about it when I was approaching your city on my way to see you." I said to him, " 'O Abu Abdullah, this is my first day, and no one knows who I am. If you give me permission, I will come every day dressed as a beggar, and I will say at the door the words that a beggar says, so you can come out to this place, and if you only yell me one hadith each day, that will be enough for me." He said to me, "Yes, on condition that you do not go to the study circles or speak to any of the scholars of hadith." I agree to your condition." I used to take a stick in my hand and wrap a rag around my head, and put a paper and ink in my sleeve then I would go to his door and cry, "Give me something, may Allah reward you." and he would come you me and lock the door of the, and tell me two or three hadith or more, until I had collected nearly three hundred ahadeeth. I kept doing that until his persecutor died, and succeeded by one who was a follower of the sunni madhab. Then Ahmad ibn Hanbal came out and became famous, and his status became great as an Imam. People came to him from far and wide. He appreciated my patience and whenever I came to his circle he would make room for me and make me sit close to him, and he would say to the scholars of hadith: "This man is a true seeker of knowledge," then he would tell them my story and he used to teach me hadith and he would read to me and I to him." Then Baqiy ibn Makhlad describes how he came ill and stopped going to majlis of Imam Ahmad ibn Habbal. When Imam Ahmad learned that he was sick, he came to visit him his house. The residents of the inn panicked when Imam Ahmad to them, and he heard them saying, "Look at him! The Imam of the Muslims coming!" The innkeeper rushed to Baqiy ibn Makhlad, saying to him, "The Imam of the Muslims is coming to visit you!" Imam Ahmad ibn Hanbal sat by his head and the room with his companions, but there was not enough space fir everyone, so some of them had to stand outside, with their pens in their hands. Imam Ahmad prayed for healing for him, saying, "May Allah grant you good health and bless you with His healing Right Hand." Baqiy said: I saw them with their pens writing down what he said." Imam Ahmad went out, and the owners of the inn came and started to treat Baqiy kindly. They brought him a mattress and blankets, and the best kinds food. Concerning that Baqiy said: "they nursed me better than my family would have if I had been amongst them, because of the visit of a righteous man."